The art of adornment would have been without the precious, glittering metal that we called gold. It is used to symbolise prosperity, health, wealth, lives of the nation’s culture and it in today’s life is a quintessential to women’s jewellery boxes. Gold has been treasured for its radiance, lustre and natural beauty throughout the history. Due to this many regions have imagined to represent the sun by gold. We get a number of palette of colour nowadays but the yellow golden jewellery is the still the most popular colour among the present population. For the last 100 there has been a lot of changes. Jewellery has been staple for both men and women with as equal importance since the prehistoric time. But with the passage of time the jewellery trend have changed a lot but the value of this material is still the same. Evolution of golden jewellery according to need. 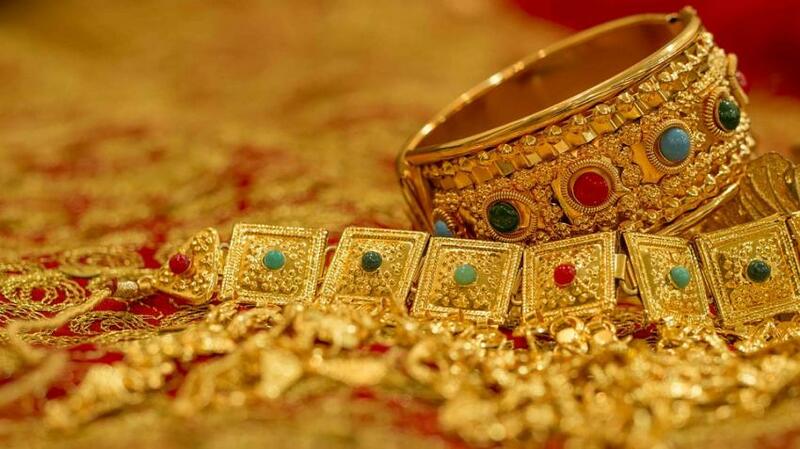 Rajputana jewellery: The Rajput dynasty brought skilled artisans with them, these artisans induced gold jewellery. This started with the Kundan gold jewellery and Meenakari, which is a unique art and requires extraordinary skill set. Gemstones are mixed with pure gold to form stunning pieces. The designs like Meenakari, Kundan and Thuva work from the Mughal age are extremely popular today. Some regional bride looks are considered to be incomplete without these jewelleries. Filigree design: The filigree design has lace like appearance with interwoven gold wires. Making of such designs was practiced in Cuttack. This design still gets the same affection across the nation. The modernity look it gives and the light weight for its materials make it an appropriate choice to bring up a sophisticated look. A bride jewellery: A bride in today’s modern world still craves her wedding ornaments to be those royal designs with new trends. Lofty and long necklaces have replaced layered Ranihars. Gold chain models are now found in various colours that gives a no of choice. This makes the look more stylish and trendy. The new trend also includes gold bangle design with weight. And these are the new favourite of every bride. This smart and broad bangles give a complete bridal look and can give a beautiful matching appearance with the wedding attire. Working women jewellery: The working women prefer a delicate wear. This delicate designs can give them a sophisticated look. This includes matte gold chain, curved bracelets and some sort of bangles. This light wear even goes with their formal attire and doesn’t look heavy and can give perfect look for their daily work purpose. One of the most important reasons that make gold popular even in today’s world is it’s property due to which it doesn’t react with atmospheric moisture and doesn’t cause any rusting .The craze for gold is still as significant as it used to be . People of all ages can opt this jewellery. Golden jewellery can make one beautiful which can easily bring up ones confident. Nowadays we don’t only get traditional designs but also trendy and light weight new collections in the colour of gold differs with the kind of alloy mixed. The best part of gold is that it never goes out of style. Style and trend can change but the value of this precious, lustrous metal has always remained the same. It has been years and is still the most popular metal with a value that continues to rise with the new generation.